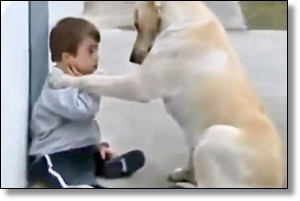 A little boy named Hernán and a female yellow lab called Himalaya have been melting hearts around the web with a viral video of the moment the two became friends. Hernán, of Buenos Aires, has Down Syndrome, which causes him to shy away from physical contact, according to his mother Ana. In a comment on YouTube she wrote, "He does not like be touched, but Himalaya insisted so patiently, and she was so soft that's why it is so moving, she is left to do anything." In the video, which now has over 10 million views, Hernán sits on a patio, with a persistent Himalaya inching closer to him. Himalaya makes several attempts to touch Hernán with her paw, but he keeps pushing her away. She rolls onto her back in a playful fashion, while little Hernán presses closer to the wall behind him. Finally Hernán begins to play with Himalaya's feet and nose, and by the end of the video, what began as an attempt to move away from the dog has turned into something of a game. "There are times when the simple presence and loving nature of a dog can help persons with special needs to open up to the world around them. Special needs therapy dogs have been particularly beneficial for persons with Autism, developmental disabilities, Down's Syndrome and those who have suffered a stroke. With the presence of these dogs, persons can work on therapies that help improve speech, coordination, and social skills." According to Assistance Dogs International, Golden Retrievers and Labs in particular have good characteristics for service to special needs individuals, including confidence and sociability. They are also easy to care for, and not overly protective. Watch the video of Hernán and Himalaya below, then jump into the comments and share your favorite stories of loving and amazing pets. This Woman Helps Disabled Dogs Walk Again! Thinking of Getting a Pet Turtle? Meet Cuzzie, He Loves Getting In The Hot Tub! Does the Royal Family Actually Walk Its Own Dogs? Cat Scratch Disease - Do You Know What It Is? How Much Do Dogs Really Remember? Can Dogs Feel When You Cut Their Whiskers?